Man’s best friend has a new job, and it’s in the Ag industry. 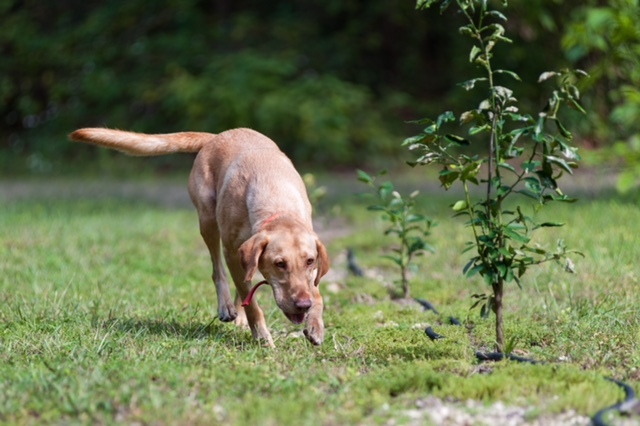 As reported in Citrus Industry Magazine, the use of canines or “sniffer dogs” is again being investigated by the USDA for early detection of HLB-infected trees. Plans are underway to test the dogs soon in California. Results from previous tests show that properly trained dogs can identify citrus trees in very early stage of the disease with as much as 98% accuracy. The dogs are most accurate when HLB is not overwhelming, instead is found only in a small part of their sample. The dogs were first tested in Florida and Texas, but they were not as effective there – there was just too much HLB around. They are coming to California because the disease has been geographically isolated and outbreaks have been limited to individual trees. The canine test will mainly be funded through the HLB Multi-Agency Coordination (MAC) System, a method devised by USDA to streamline funding for HLB related projects. The HLB MAC program has already invested millions of dollars in the research and the training of detector canines. The initial testing is being overseen for the USDA by Tim Gottwald, a Florida-based USDA researcher. Dr. Gottwald is the principal investigator for the HRB Mac project. The dogs are owned by USDA and so the work over this next 18 months or so is going to be done under their control. There are several issues to overcome, including training the dogs to work on California soil, which is different from their home dirt in Florida. The various groups involved also need to learn how to work with the various regulatory agencies. Also, some growers may have confidentiality concerns on the locations the dogs are working. The USDA investigators will need to work with grower groups to increase their acceptance and confidence in the dogs, and to learn what management actions should be taken if the dogs alert on trees. But there is a lot of hope that using the dogs will speed up HLB detection, which will mean faster control of any future outbreaks. You can read the whole story online at citrusindustry.net. And full disclosure, it’s my article, I wrote it with a lot of help from some pretty fine dogs that keep me company at home. I’m Len Wilcox, and that’s the Western View from AgNet West, brought to you by Citrus Industry Magazine. Check us out on the web at www.citrusindustry.net.